Get up close and personal with Nokia Android phone, the latest smartphone to join the Android market. 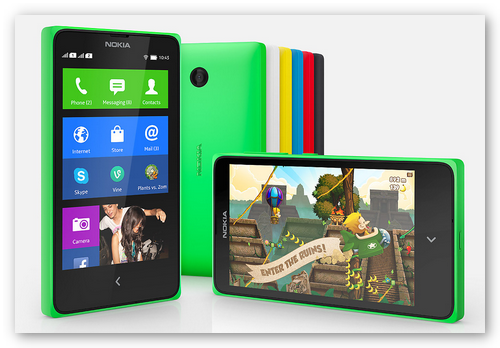 Find out what features and capabilities Nokia X has to offer. Just when it seems that Nokia has finally thrown in the towel in favor of Google’s Android, better think again. Although the operating system of Nokia X is based on Android AOSP (Android Open Source Project), it is far from any typical Android phone. The most noticeable difference is the unavailability of essential Google Apps like Google Play Store, Google Maps and more. This is a big let-down as far as downloading of Android apps is concerned. While you may be able to download apps via its pre-installed Nokia App Store, it is still a far cry compared to the number of free downloadable apps you can avail from Google Play Store. Fortunately, access to 3rd party Android App store is permitted by Nokia enabling you to download more apps. Alternatively, you may also install shared APK files courtesy of other Android users but you need to check first the device compatibility. Even though Nokia X is running on Android platform, the interface together with some of its pre-installed apps like Microsoft services (OneDrive, Outlook, etc. ), it can be seen as a reminiscent of a Windows phone. In a nutshell, Nokia X is a fusion of Android and Windows phone . Nokia X is powered by a dual core 1 GHz Qualcomm Snapdragon™ S4 processor. It sports a 4 inch IPS (in-plane switching) LCD with a screen resolution of 840 x 400 pixels and pixel density of 233 ppi. The internal storage capacity is 4 GB which is expandable to 32 GB external storage (microSD card). The supported audio and video playback format includes MP4, 3GP, AAC, MP3 and MIDI. Lastly, the back cover of Nokia X is available in a variety of colors namely black, blue, green, white, yellow, pink and red. Aside from the fact that Nokia Android phone is not a 100% Android phone, perhaps the deal breaker would be the phone camera which is a unique selling point for smartphone consumers. The main camera (rear) has a camera sensor of 3 MP and resolution of 2048 x 1536 pixels (no flash) while front facing camera is a big disappointment because there is none.